How to tune a filter? I've been tinkering with an old filter that I once had working on 910 MHz. I found that I had no way to tune it up! In the past, I was able to bring filters into work and tweak them during my lunch hour.. But, now I'm retired and don't have the money for expensive gear. So, I'm looking for DIY way to get the job done. Since I have receivers that can hear 1090, all I really need is a good signal source.. 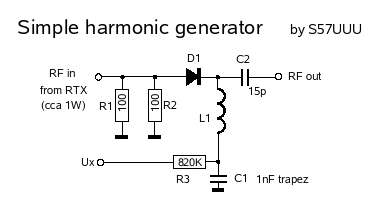 It needs to have enough power, to get past all the attenuation inherent in an Un-tuned filter..
First, I looked at getting a broad-band noise generator. I've used them before, but never for tuning filters. Factory made units on Ebay seem to costly. The diodes aren't too expensive.. But, how to drive the diode.?. I need a VHF transmitter that has a harmonic on 1090 MHz! My VHF Ham radios are on 144 to 148 MHz.. Wait a sec! I own one of those digital FM stereo transmitters! And 99.1 Mhz x 11 = 1090.1 Mhz !! I think it's got about 2 Watts out in high-power.. I also have a 1296 MHz amplifier that I could use to boost the L-band harmonic signal level, if needed..
What do you guys think? Will it work? Should I order a batch of diodes? I found a noise source that appears to have good power and frequency range. 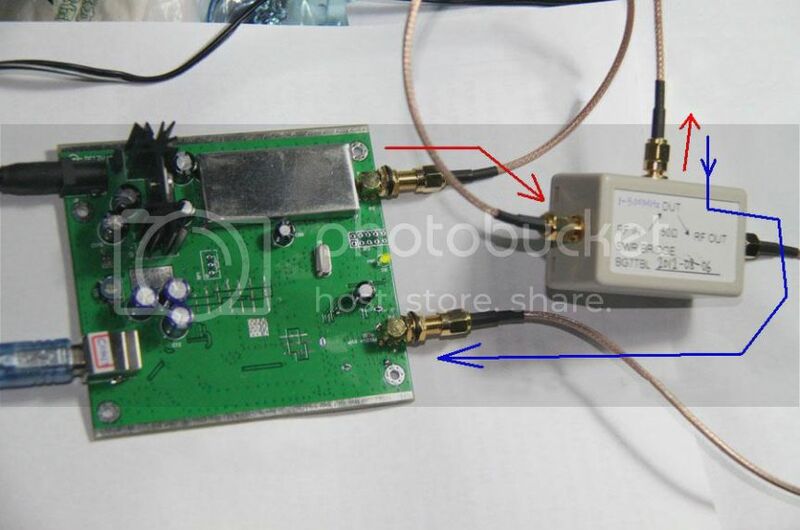 "0.1MHz-550MHz sweeper analyzer+attenuator+SWR bridge+SMA Cable"
It looks like a good device for testing DIY antennas and filters. But it's frequency range is limited. 550 MHz top end isn't good enough.. However, this little system gives us the layout of pretty good (and cheap) system for the home experimenter or Plane Finding Ham . This looks like a USB controlled frequency RF generator, driving a directional coupler (labeled SWR Bridge). and the RF Out port is where the Reflected RF signal is tapped off, and returned to the board. I assume that Input to the board goes to a detector diode, to create a DC voltage that is measured (voltmetered) to represent the SWR/reflected power from the antenna. If the reflected power is low, (at the desired freq) that means the antenna is good.. I think you could also test (or tune) a filter by connecting it across the two SMA ports on the board. Comes with software and USB cable..
with their external 25 Mhz clock.. If this unit has it's own clock (time-base for the synthesizer), that port isn't really necessary. (I asked the vendor, and he told me, it's an SMA).. So, to use this baby at 1090 Mhz, one would need a detector setup.. A directional coupler like this one maybe? And a diode to detect the reflected power (SWR) from the DUT (Device Under Test). Something like this would be really good.. If you could find it cheap.. Otherwise, I think building your own microwave diode RF detector shouldn't be too difficult. Saw this video and found it interesting. Gives me some ideas of what kind of antenna testing can be done..
35Mhz-4.4Ghz ADF4351 evaluation board diagram. That RF IN (J1) is actually a place to insert a stable 25 Mhz reference, or to tap into the on-board 25 Mhz reference oscillator. This looks like a pretty good board and it looks like the provided USB interface board isn't too over priced. This board without the USB is about $65USD, and $82 for the 'kit' with USB and the cable ($17 more). there might be some other info sources if needed.. Currently he only has the calibrated version in his store but there was an uncalibrated unit available in the past for $90 less. I've been considering that unit or possibly one of the new SDRs such as HackRF or BladeRF. I saw those before and got to digging around for something more in my price range. I'm still leaning towards the $82USD kit, since I already have most of the parts I would need to do basic filter tuning. and set the 82$ generator to sweep from the 1090 band, Then tweak away. Since it's all packaged up in a nice little case.. But the low end is 138 Mhz and that's a little too high for my needs.. I want to be able to tune filters on the VHF air band. The $82 rig will go down to 35 Mhz.. I'm not interested in calibration, and trying to measure very accurately. I can use an accurate adjustable attenuator to get me close enough. Would the diode RF detector only be needed for SWR measurements with a voltmeter? I wonder if the the software that comes with the $82 RF signal generator allows control over the output power? Or would an additional attenuator be needed? How much power can the SDR dongle handle through the antenna input? If I understand all this correctly, one could do the measurement shown in the 978 MHz antenna video above with the $82 unit set, a directional coupler, attenuator (? ), antenna/filter, and SDR dongle. The RF signal generator's output level would be set to sweep a frequency range at a 0dB level in SDR# without the antenna/filter. Then do the frequency sweep again with the antenna/filter connected to check return loss. Does that sound right? I'm new to this and just trying to make sure I understand. Yeah the $82 unit has adjustable output, and I also have some adjustable attenuators.. I think you've got the idea. SDR# looks to be the a good match to the $82 special.. I have a directional coupler for 950 MHz to 2 GHz, and a diode installed.. (Pic below). The Ham that gave it to me, used it at 2.30, 3.40 & 5.70 GHz. I used this rig to on my 915 Mhz and 1.269 GHz ham gear and antennas. so that the sweeping frequency won't have to be very strong (and interfere with communications). Just the same, I would avoid slow sweeps across 1090 that can radiate more than a few hundred yards. But for filters, the RF will be contained and higher power can be used. No leakage, if you are careful. That factory made SWR meter underneath, is good to 500 MHz.. But only if you are running more than about 5 watts of power.. So, I'm thinking I could tap into the diode-to-meter line with a BNC, and measure it with something more sensitive.. I'm still not completely clear on the function of the diode but I think it's needed to convert RF to DC for an SWR meter? And I wouldn't need one if I'm doing a return loss measurement like the 978 MHz antenna test video? Now I need to figure out how much attenuation I'd need to connect the $82 unit's output to the SDR dongle's antenna input. From what I've seen on the net -40 dBm would be a strong signal. So what's the output power of the $82 unit and how much attenuation would it need to get down to -40 dBm? The reflected (or forward) power tap off the coupler, puts out RF, so you can use any instrument or device that can measure the power level. 1. Install the coupler to measure forward power, record the level from the port. 2. Reverse the power-in-out to the coupler and measure the reflected power. 3. Get out the calculator. to the other, that will give you the SWR number. Which is a ratio.. Here's the link info from the seller. I found the unzipping a little weird, but somehow got it done.. I think I'm getting it... But am I correct that the signal sent into the dongle's antenna connector must be very low level? According to this doc is actually has to be down around -70 dBm to avoid overload. The power level has to be good enough for your reflective sensor.. A diode needs some good power to make voltage. But a good SDR wouldn't need much at all. It's likely the safer choice. But, if you are in a remote area (low air traffic) or in a metal barn, it should be save to run out a few dbm for a short period. (Dang, I forgot. They have satellites that listen to 1090 these days)! A Return Loss of 12 db is good for Ham work. At MIT, they want 20 db (which is hard to get sometimes). I'm talking about attenuating the signal just before in goes into the dongle's antenna input. That input can't handle the output levels of the RF signal generator. I understand that the directional coupler lowers the level but I think I'll need still more attenuation before the dongle. Do it like the guy in the video. You slowly turn up the RF Generator, with the antenna port on the coupler open (or shorted), until you see a nice sized spike on your spectrum display. That's all the power you will need. Then connect up the antenna and test away.. If see a peak that's very low, that good.. If it's real high, the antenna needs work..
Don't start testing anything using above zero dBm is the rule. When I've tested devices that were rated for 6 dBm, I always started down zero and slowly move upwards..
With the sensitivity of the dongle, you might be wise to protect it's front end..
could still hear nearby planes, with 20 dB of attenuation in the antenna line! If I just dropped in 5 or 10 dB of loss, it wasn't hardly noticeable..
Those dongles are pretty dang good radios!! Keep an eye out for a surplus attenuator.. This type is pretty cheap, since they don't do clean 1dB steps.. If I get the $82 Gen, I'll be using this one (below) for L-band stuff..
And of course some standard SMA attenuators are great to have. The little 20dB pads work great with a 1 to 20 db variable. You can use a few extra 20dB pads and get a lot of range from your 1 to 20 db variable.. So some serious attenuation will be needed (like -40dB). This calculator seems like a good way to get a ballpark figure to start with. According to the PDF report (link above) they are very sensitive: around -130 dBm at 1GHz. I agree... Very sensitive.. As I said above, "
If I just dropped in 5 or 10 dB of loss, it wasn't hardly noticeable.."
Later on, I actually inserted 30 db of loss, and I could STILL decode a few packets from nearby planes..
That's freaking amazing. 30 db of pad cuts the signal to 1/1000 th.. That's a watered down signal..
And here I am, worried about a few extra feed of coax, adding in some loss..